MapsPeople participates in this year’s International Sports Convention together with our partner Sword, and our common client, UEFA. The International Sports Convention is a two-day convention in Geneva, Switzerland that features 18 sports conferences and seminars and 6,000 square meters of exhibition. With more than 2,000 people attending the convention including 150 high-profile speakers, 100+ exhibitors, and participants from 67 countries, ISC 2018 will be the world’s largest sports convention this year. 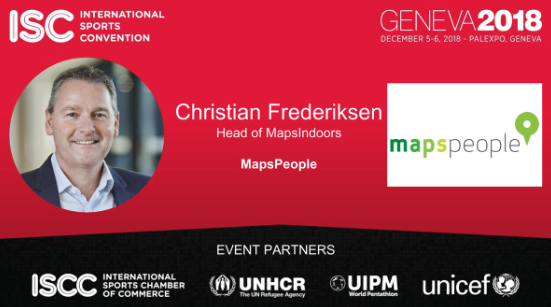 Head of MapsIndoors at MapsPeople, Christian Frederiksen, will be giving a presentation about our virtual stadium solution on December 5 11:45am. “The future of stadiums is digital, so we’re looking forward to showing our solution and how it can benefit stadiums worldwide by engaging fans, boosting sales, and help large sports organisations such as UEFA,” says Frederiksen. The convention takes place December 5-6, 2017 at Palexpo in Geneva, Switzerland. If you want to know more about our stadium solution, book a meeting on the event page or read more about MapsIndoors for stadiums.